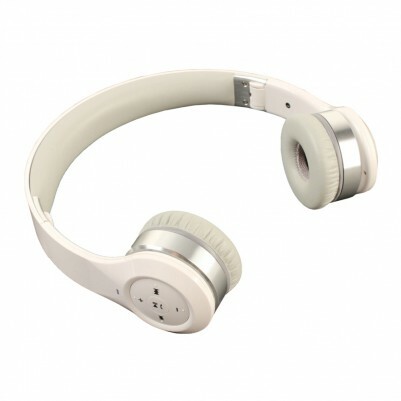 The Bluetooth Headphones can connect wirelessly to most A2DP Bluetooth® enabled devices such as Apple products, computers, tablets, smartphones and other media devices and products. Whether you are working out, travelling or simply walking around town, these Bluetooth headphones are designed to make it easier to listen to your favourite music while on the go or at home. And you can choose between 2 colours: white and black. Large Capacity Battery - many hours on a single charge. Fold them - Store them neatly or take them with you anywhere. Invisible mic - for crystal-clear conversations. Easy headset controls - Integrated controls for enhanced usability and convenience. Make phone calls - Built in mic and call answer button. Wireless freedom - Bluetooth headset works up to 30 metres away. Comfortable ear cups - for complete relaxation even in noisy surroundings. These headphones are also available in black. Click here for Black 41300 Bluetooth Headphones. Audio Frequency response: Full 20Hz to 20KHz. Normal transmission range: 10metres, up to 30 metres is possible with good transmitters clear field. Supports HFP Hands-Free Profile: to allow hands-free kits to communicate with mobile phones in a car. Applies Echo noise cancellation: to voice while in conversation mode, e.g. telephone call. If you would like to use these with your non-Bluetooth devices – TV, Radio etc we would suggest you buy a “Bluetooth transmitter.” This can simply be plugged into your device and transmit the audio to the headphones.